Even though I have a full-time harp making business, I seem to find the time to build a few guitars and mandolins each year. 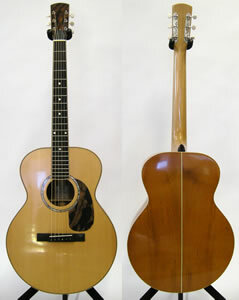 I am intrigued by a variety of historical guitar designs. 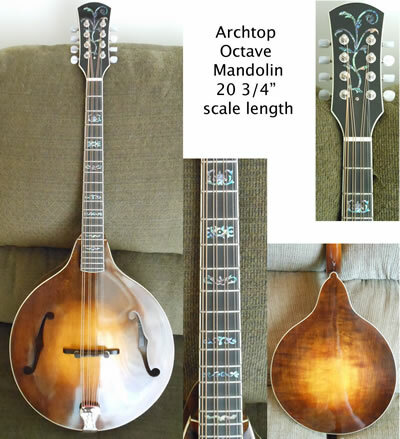 Rather than collecting vintage guitars and mandolins, I try to make copies of interesting guitars and mandolins I have seen and played. Since I can't keep them all, (they do tend to pile up), we ocassionally offer them for sale. 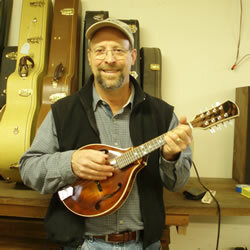 These Tenor Ukuleles are Dave's newest project. 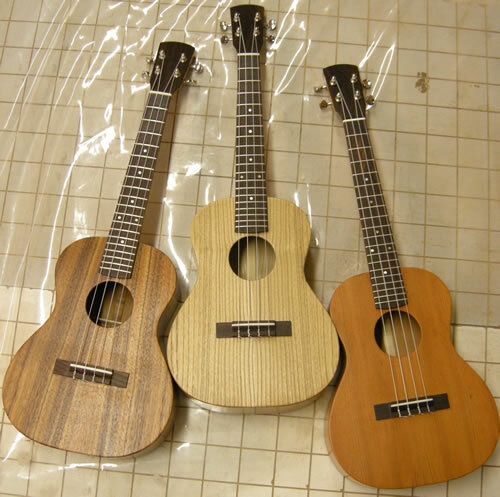 These 3 Ukes were all made at the same time. They are strung a 5th away from the 4 highest pitched strings on a guitar which means you can play it with the same chord positions that you play on a guitar. 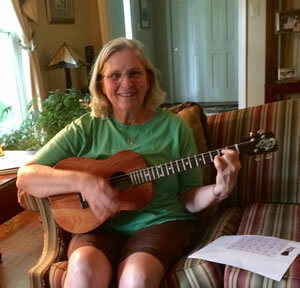 A D chord on the guitar would be a G chord on the Ukelele; a C chord would be an F chord and so forth. Like having a capo on the 5th fret. Lots of fun! 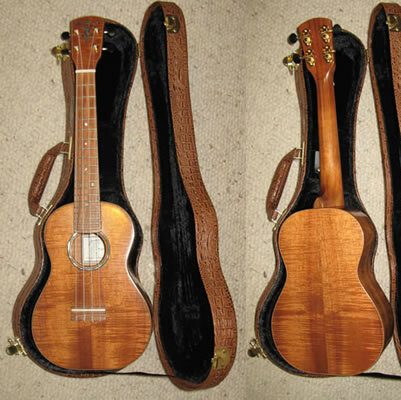 There are always new Ukes coming out of the shop so if you're interested, email us for pictures of the new ones. All of the ones to the right are now with happy owners. 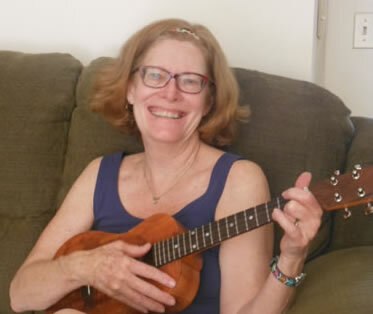 I don't need a therapist, I have a Ukulele! 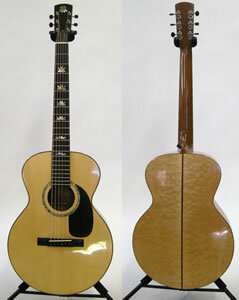 Parlor Guitar Koa/spruce with fret board and headstock abalone inlay. 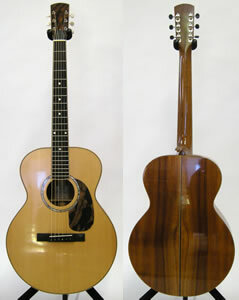 Parlor Guitar Koa/spruce with fret board, headstock and pick guard abalone inlay. 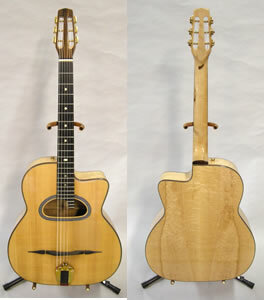 Grande Bouche Maple/spruce, Django style guitar . Inspired by the great Gypsy Jazz Guitarist Django Reinhart, this is a Selmer style Jazz guitar much like the one Django played but with a 25 1/2" scale length. 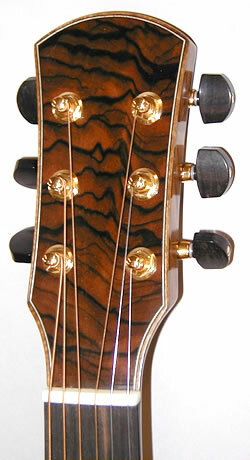 J-185 Bubinga/spruce with ebony pick guard and headstock with abalone inlay. 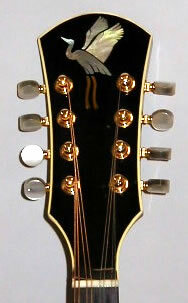 This guitar is based on the popular "small jumbo" developed by Gibson in the 1950s and used by the Everly Brothers. 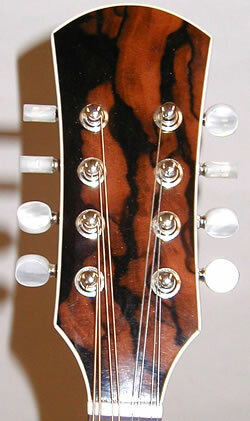 J-185 Koa Guitar, inlaid peghead. 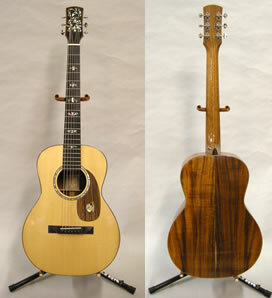 OM Koa/spruce with ebony pick guard head stock with abalone Tree of Life and fret board inlays. 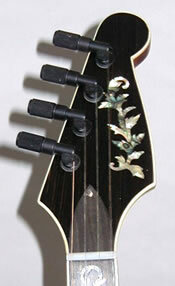 OM Maple/spruce with Macasser ebony pick guard and head stock with gold leaf Heron. I just wanted to express my thanks in creating such a glorious instrument. 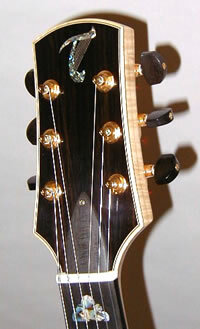 Archtop guitar, Maple/spruce with abalone T inlay on the headstock and sailboat inlay on the pickguard. 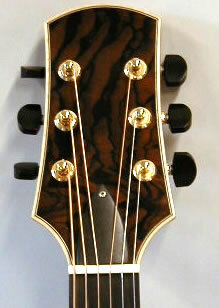 Archtop Maple/spruce, Macasser Ebony headstock. 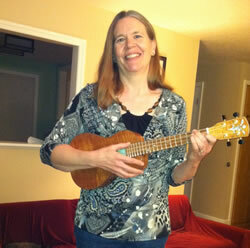 Just wanted to let you know that I'm loving this new ukulele. It will be played everyday! 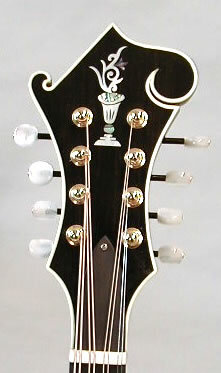 F style Octave Mandolin Maple Archtop with scroll. 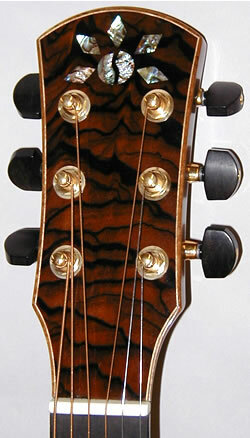 Sunburst stain, ebony head stock with inlay. 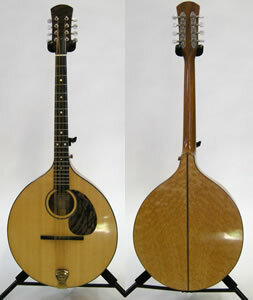 This instrument is tuned one octave lower than a standard mandolin. 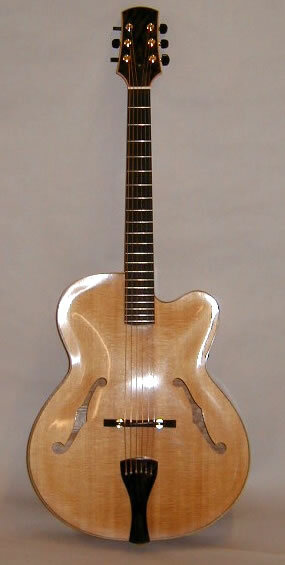 A style Archtop Mandolin Maple and spruce, f sound holes, Macasser Ebony peghead. 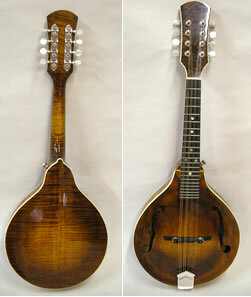 I am very pleased with this beautiful mandolin, actually that is putting it mildly, I "LOVE"!!!! 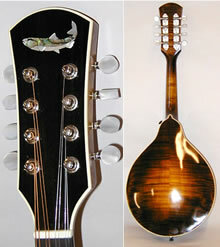 this mandolin. It chimes like little silver bells in a cathedral, or crystal bangles in a soft breeze. Though I am a novice player, everything I attempt to play is cleaner. The intonation is perfect, the tuning stays true for hours, the radiused and wider fretboard fits my style, the natural beauty of the medially lines in the top right behind the bridge where they come to a crown and around the edge where they swirl into each other is always a pleasure to look at, the flame of the maple is exquisite, the stain and slight burst is so comforting and humble, the abalone dots complement the theme of this instrument perfectly, the purling is simple and honest, the peg head veneer is waves of all the colors on the rest of the instrument, I have looked at it very closely and I am SOOOOO! glad you chose to keep the macasar with the separation, it increases my affection for the concept of a one and only unique to me handmade instrument immensely. 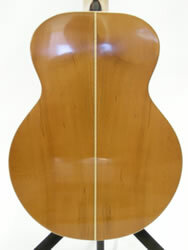 A style Archtop Mandolin Maple/spruce, oval sound hole with peghead inlay. 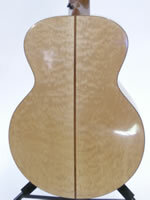 A style Archtop Mandolin Maple/spruce archtop with sunburst stain and ebony head stock with salmon inlay. 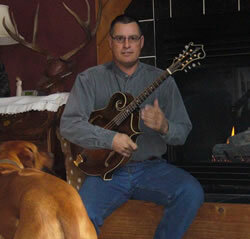 "This mando got 4 thumbs up from Tom Bekeny, mandolin player for the Kathy Kallick band. 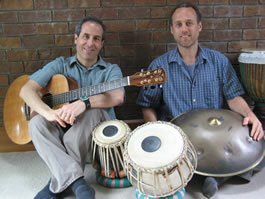 Tom Rozum (Laurie Lewis band) wanted a chance to play it, too, but he was swamped with work. Tom isn't easily impressed, and all he could say were really great things about it. 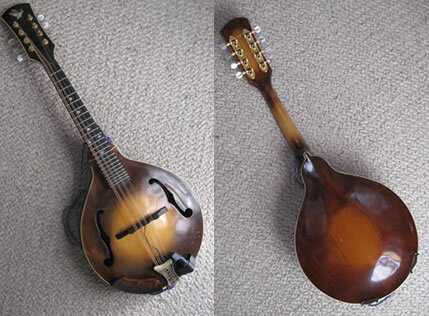 So, thanks again for the mandolin, it's found a good home." 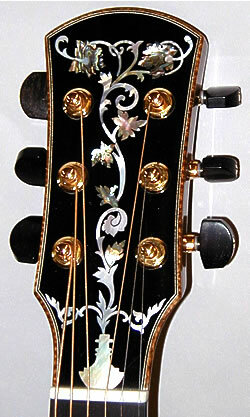 Mandolin Archtop, sunburst stain, ebony headstock with abalone Heron inlay. 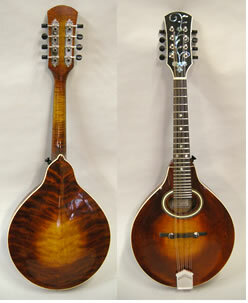 A Style Mandolin Archtop, sunburst stain, Macaser ebony headstock. "What a beautiful instrument. This is a stunning creation. I just finished playing it and it's so easy to play. I'm already a better mandolinist. I just marvel at the instrument. Thank you so much." My name is Tom Kammerer, and I live in Yachats. 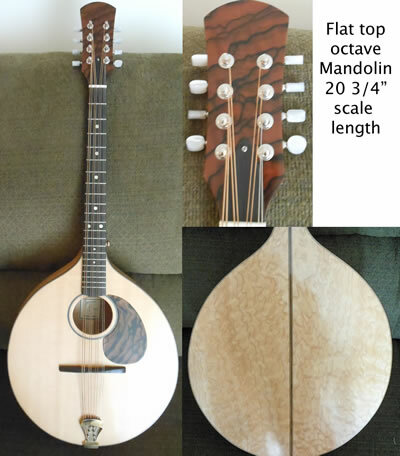 I wanted to let you know that I am really enjoying your mandolin #1261 (2012) which I purchased recently at Fingerboard Extension, in Corvallis. 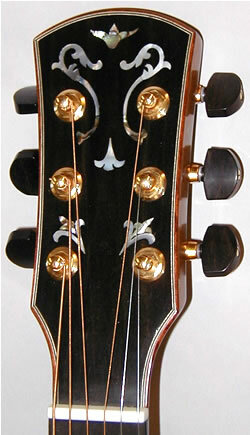 It has a bell like tone that is truly amazing! It is also a beautiful instrument. 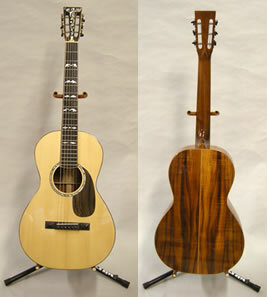 I have been playing a Breedlove American OF VTG (2013), with similar configuration, and this is a very nice upgrade. No picture available at this time.